Seminarian Dane Connelly interacts with students in the halls of Bishop Ludden. Students at Bishop Ludden Jr./Sr. 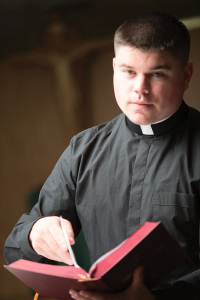 High School have been benefitting from seminarian Dane Connelly’s presence at their school. Beginning in January 2014, Connelly spent his pastoral year at St. James Church in Syracuse and also helped out at Bishop Ludden two days a week. Connelly works in tandem with Bishop Ludden’s campus minister Amanda Webster and faculty member Fr. Dan Muscalino. He also serves as chaplain to the school’s soccer team—even practicing with the squad as time allows. Connelly said he wants to be as present as possible at the school. “I’m open to meeting with students who have questions,” he said. Connelly’s personal struggles with his discernment to become a priest make him a great resource for the students. Born in Waterbury, Connecticut, and raised in Chittenango, New York, where he is a member of St. Patrick’s Church, Connelly graduated in 2006 from Chittenango High School where he played soccer, lacrosse and volleyball. “I first started to become personally interested in my faith when I was in high school,” said Connelly, who notes that his participation with his parish’s youth group greatly influenced the development of his faith. In his junior year of college, he spent a semester in Austria and travelled throughout Europe. After meeting Fr. Kim Shreck from the Diocese of Pittsburgh while in Rome, Italy, Connelly asked the priest to serve as his spiritual director. At that point, he became interested in the priesthood. After graduating from college in 2010, he attended St. Mary’s Seminary and University in Baltimore, Maryland. In 2013, Connelly took a leave of absence from the seminary. He went to live with his grandmother in Connecticut, where he worked as a substitute teacher and a Starbucks barista. Connelly had misgivings and fears. He worried that he wouldn’t be a good priest, that he would be disliked and that he wouldn’t be faithful to his calling. While living in Connecticut, Connelly found another spiritual director. “He was a very holy priest,” said Connelly. “If it weren’t for him, I probably wouldn’t have come back. He made me focus on putting God first before myself. Eventually, Connelly did come back –and landed at St. James Church and Bishop Ludden. Connelly hopes he has encouraged students to consider the call to the religious life by sharing his story and showing them that the journey to answering God’s call is not always a straight path. It can include times of both doubt and great faith.